Brightly coloured, zingy dinosaurs hanging out in the jungle! Pop dino is inspired by my love and intrigue of drawing these special creatures. 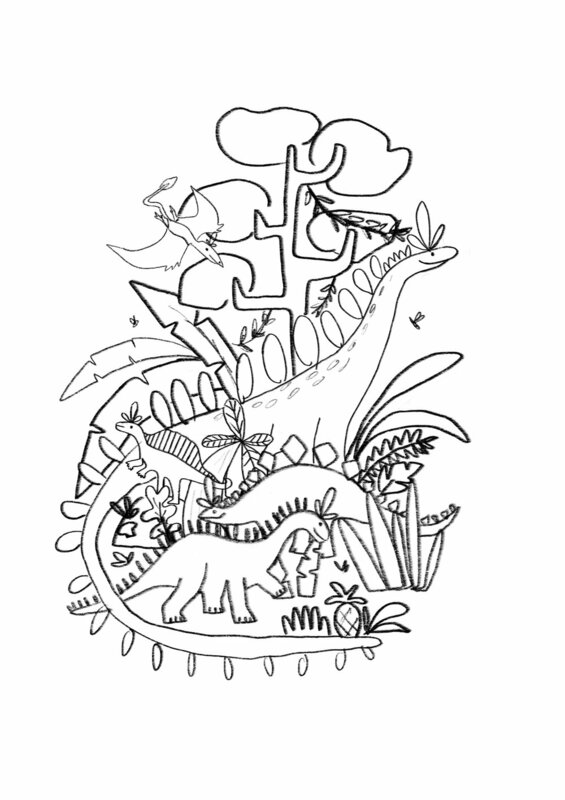 Firstly created in my A-Z of dinosaurs, which has been hugely popular. Keeping to a four colour palette, rendered with 6B pencil combined to produce spark and flair. Hey, howdy, hello! I'm May from the South coast, freelance illustrator and designer. I love creating colourful work that is fun and playful for children and adults alike! I really enjoy creating patterns and engaging in subject matter of made up creatures and interesting worlds. I take my inspiration from leaves and organic shapes found in nature. My natural way of working is with my iPad pro and apple pencil, it is very versatile for illustrating in different mediums and keeping the same feel as analogue techniques. Tell us a fun fact about you I have a dog called Buddy and he has a mohican! How did you get into illustration? Being a creative bean from an early age, I enjoyed any practical subjects especially Art. Carrying out a Foundation degree and choosing the pathway Illustration, I then decided to study BA Illustration. My love for Illustration has grown and grown over the four years studying, and I am a keen children's picture book maker and pattern designer. Since finishing my degree I am pursing my greetings card range, print designs and commissions. Who or what inspires you the most? I'm inspired by the organic tapes found in nature, especially LEAVES!! I love drawing these shapes and bringing made up environments together to create funky looking illustrations. What does a typical day look like for you? My typical day consists of having a notebook/sketchbook to hand and recording anything I find interesting that could be used as content. Replying to emails and of course creating Illustrations! What do you do when you have a creative block? When i have a creative block, which does happen from time to time!! I get researching and create a huge mood-board of inspiration, looking at other practitioners work and things of interest. This usually kick starts the visual process and then I start sketching content around a specific subject matter. Top three clients you've worked with? I've really enjoyed working with the Picnic Park Deli, to produce an illustrated map to situate them within their park. Also enjoy bringing clients ideas to life for their own personal briefs! What tools (digital or not!) do you use to create your work? Tools wise I am in love with my iPad Pro and apple pencil, it has been a revolution in the way I work! I tend to use a 6B pencil on the iPad and I am able to create the same feel as I would on paper but with more refinement. What's your favourite resource for inspiration? Inspiration comes from all around, the internet is a huge pool of inspiration especially on Pinterest and Instagram. I love seeing other peoples work, and enjoy going to exhibitions especially the Saatchi gallery in London. Do you have any tips for artists thinking of doing freelance? Top Tip 1: Be super motivated and determined, you can do it! Top Tip 2: There's always work out there, sometimes you have to make the work, to find the right client, who needs the work! Top Tip 3: Remember to carry out personal projects along the way! What would your dream project be? Of course having a Children's Picture book published but I would also love to design children's clothes for Joules, Boden and White stuff! !